Photo Slideshow Director HD can apply random transitions between photos. However you can change transitions manually. 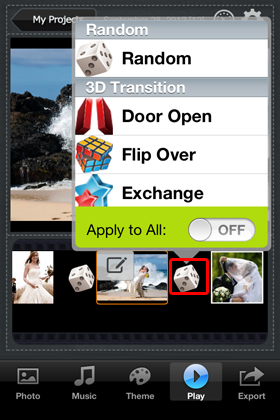 Tap the dice icon between photos and tap one transition you like to replace the current transition. Then change other transitions in the same way. To apply one transition to all slides, you need to toggle Apply to All ON / OFF slider from OFF to ON. Then choose a transition and tap to apply it to the whole slideshow.